Concrete, tile adhesive or varnish residue – traditional sanders often fail on difficult substrates. The MENZER concrete grinder is the perfect solution: In conjunction with a number of matching milling heads and cup wheels, this machine can tackle any substrate with ease. An adapter on the machine allows the connection to any industrial vacuum cleaner to remove potentially hazardous fine dust. Tradesmen are faced with a great variety of materials and substrates during renovation works. Traditional sanders may quickly reach their limits when it comes to grinding or keying of hard, tough or thermoplastic materials. When it comes to concrete, plaster, screed, joint adhesive or varnish residue: concrete grinders take care of the most challenging substrates. A powerful, high performance and robust concrete grinder – also known as a scouring machine – is the specialist tool needed when the going gets tough. MENZER offers a variety of cup wheels and milling heads to deal with virtually any substrate thoroughly and efficiently. The SF 125 concrete grinder is the perfect choice for difficult substrates: MENZER offers a number of specifically optimised diamond cup wheels for the milling, grinding and keying of plaster and concrete. These can also be used for the sanding of concrete or screed and for the removal of formwork joints. 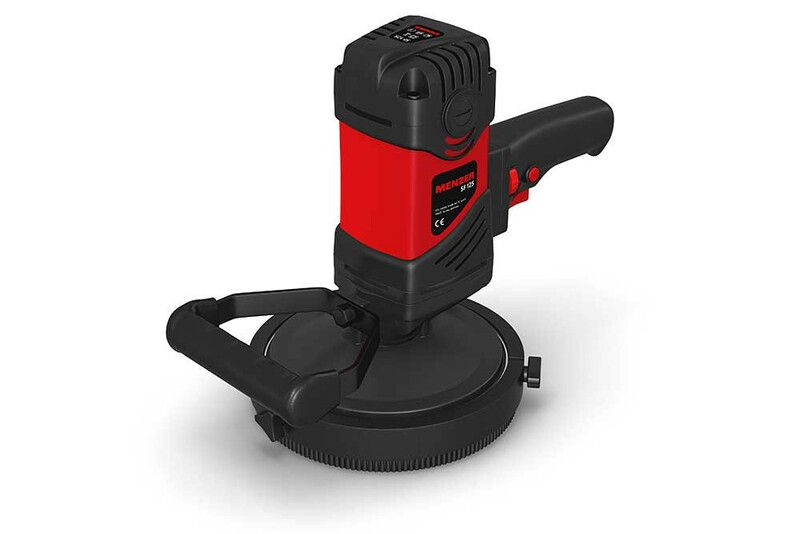 The concrete grinder can also handle they keying of old tiling and tile adhesive when combined with a carbide grit cup wheel or milling head by MENZER. These abrasives are also an excellent choice for the removal of joint fillers as well as old fillers and levelling compounds. They will leave no trace of adhesive or foam back residues on floors. Thermoplastic materials like paints, varnishes or epoxy resin coatings are a challenge for most scouring machines. These materials soften during sanding and can clog up the abrasive. The right MENZER accessories in combination with the SF 125 ensure perfect results on these substrates. Relevant safety equipment must be used when working with a MENZER SF 125 concrete grinder. Always wear safety goggles when working with the SF 125 to protect the eyes from dust and flying debris. A mask is a good idea as well to prevent the aspiration of dust and material particles. Make sure to use the concrete grinder only in combination with a high performance industrial vacuum cleaner, e.g. the MENZER VC 790 PRO. The SF 125 comes equipped with an appropriate hose adapter for that purpose. Extracting the dust at the source will remove harmful fine dust quickly and safely.